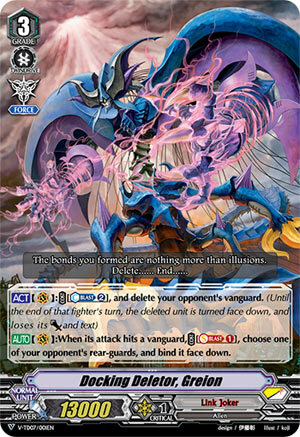 [ACT](VC):COST [Counter Blast (2)], and delete your opponent’s vanguard. (Until the end of that fighter’s turn, the deleted unit is turned face down, and loses its [Power] and text) [AUTO](VC):When its attack hits a vanguard, COST [Soul Blast (1)], choose one of your opponent’s rear-guards, and bind it face down. So finally new releases are coming this week and so I figured now was as good a time as any to finally get to move on to more interesting and frankly greener pastures. Greion here is obviously the first ride here for the new Link Joker deck, basically screwing VG abilities like Pentagonal Magus as well as making 20k+ columns into shield eaters or free damage. Obviously a skill like this means Greion cannot be searched and should you ride Greidhol instead the deck slows down by quite a lot, but as far as the standalone card is concerned, it’s pretty baller. The on-hit is basically just there for free pressure, although against some decks like Neo Nectar, Royal Paladin etc it’s obviously bad, but I’ll assume you’re sensible enough not to do that. Pretty nutty that we can now Delete without a -1 to ourselves now. Solid is the word.